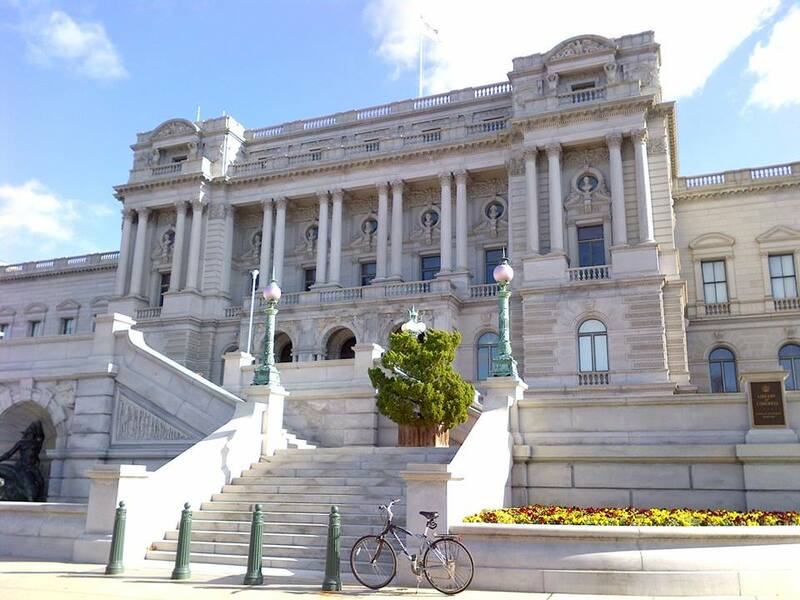 In 1800 President John Adams approved legislation to appropriate $5,000 to purchase “such books as may be necessary for the use of Congress,” thus establishing what would eventually become the largest library in the world – The Library of Congress. The first books, ordered from London, arrived in 1801 and were stored in the U.S. Capitol Building, the library’s first home. The first library catalog, dated April 1802, listed 964 volumes and nine maps. Twelve years later, the British army invaded the city of Washington and burned the Capitol, including the then 3,000-volume Library of Congress. Former President Thomas Jefferson, who advocated the expansion of the library during his two terms in office, responded to the loss by selling his personal library, the largest and finest in the country at that time, to Congress to “recommence” the library. The purchase of Jefferson’s 6,487 volumes was approved in the next year, and a professional librarian was hired to replace the House clerks in the administration of the library. In 1851, a second major fire at the library destroyed about two-thirds of its 55,000 volumes, including two-thirds of the Thomas Jefferson library. Congress responded quickly and generously to the disaster, and within a few years a majority of the lost books were replaced. 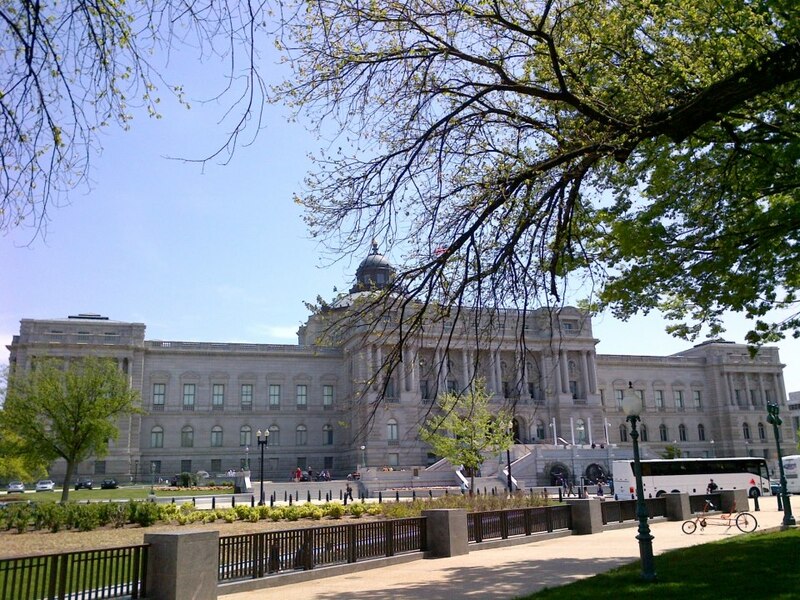 After the Civil War, the collection was greatly expanded, and by the 20th century the Library of Congress had become the de facto national library of the United States and the largest library in the world. Currently the Library’s collections include more than 158 million items on approximately 838 miles of bookshelves. The collections include more than 36 million books and other print materials, 3.5 million recordings, 13.7 million photographs, 5.5 million maps, 6.7 million pieces of sheet music and 69 million manuscripts. And the Library continues to grow. It receives some 15,000 items each working day and adds approximately 12,000 items to the collections daily. And approximately half of the Library’s book and serial collections are in languages other than English. 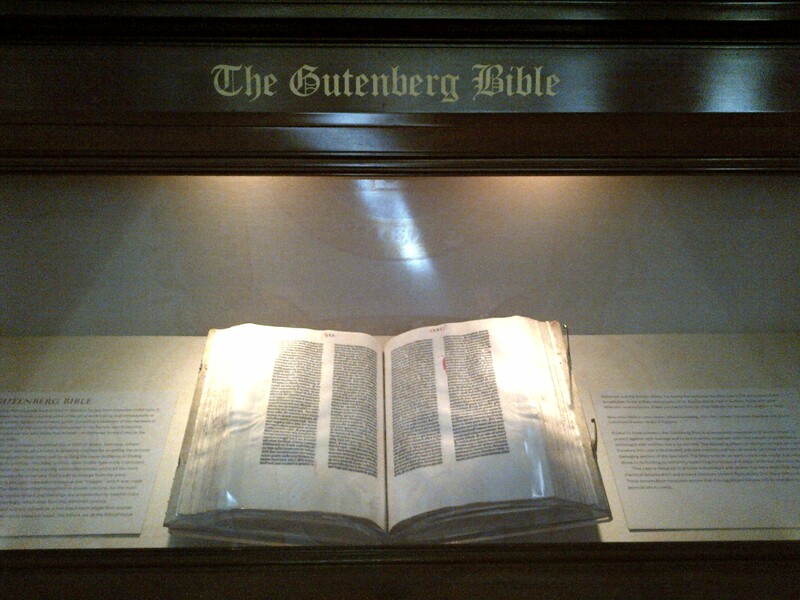 The collections contain materials in some 470 languages. 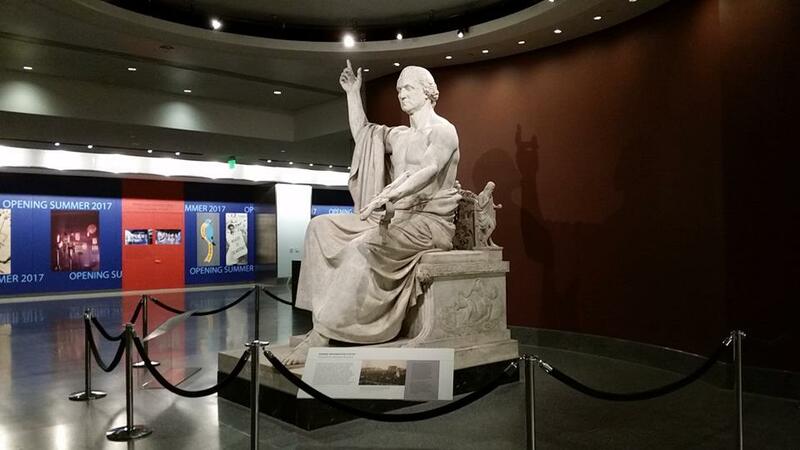 The collections are housed in three enormous buildings in D.C. – the main building, the Thomas Jefferson Building, as well as the John Adams Building and the James Madison Memorial Building. There is also a fourth building in Culpeper, Virginia. 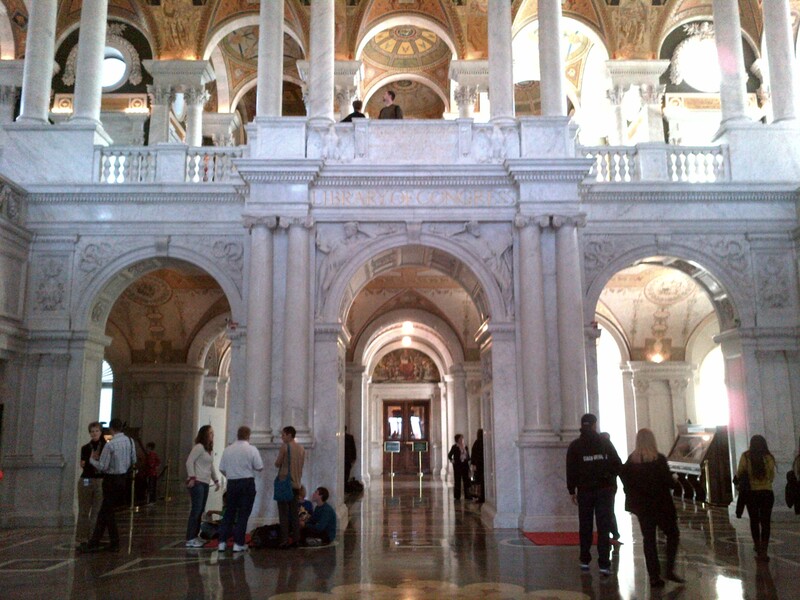 The fourth building, the Packard Campus for Audio-Visual Conservation (MAP), is the Library of Congress’s newest building, opened in 2007. It was constructed out of a former Federal Reserve storage center and Cold War bunker. Although it’s only 71 miles away, I didn’t ride my bike to Culpeper to see the fourth building. The Thomas Jefferson Building is located between Independence Avenue and East Capitol Street on First Street in Southeast D.C. (MAP). It first opened in 1897 as the main building of the Library and is the oldest of the three buildings. 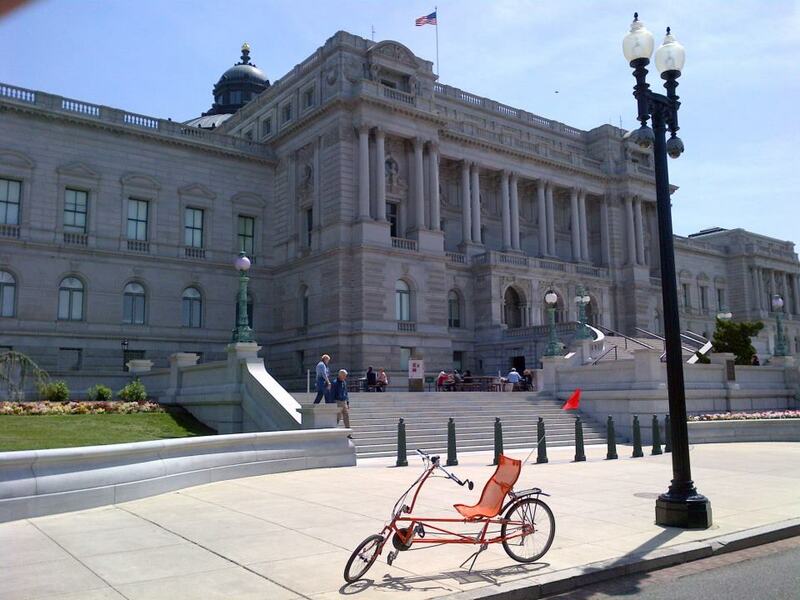 Known originally as the Library of Congress Building or Main Building, it took its present name on June 13, 1980. The Elizabeth Sprague Coolidge Auditorium, which opened in 1933, has been home to more than 2,000 concerts, primarily of classical chamber music, but occasionally also of jazz, folk music, and special presentations. Some performances make use of the Library’s extensive collection of musical instruments and manuscripts. Most of the performances are free and open to the public. The James Madison Memorial Building (see photo below, second row, left) is located between First and Second Streets SE on Independence Avenue in D.C. (MAP). 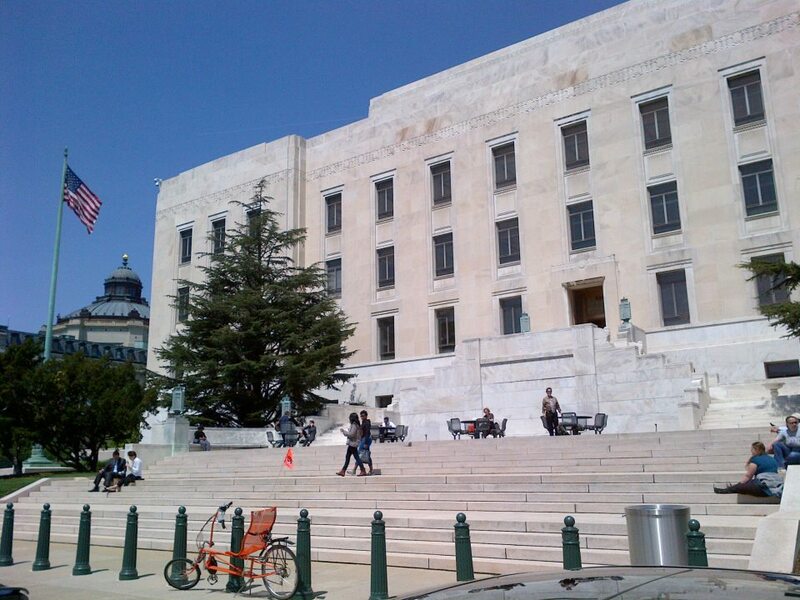 The Madison Building is home to the Mary Pickford Theater, the “motion picture and television reading room” of the Library of Congress. The theater hosts regular free screenings of classic and contemporary movies and television shows. 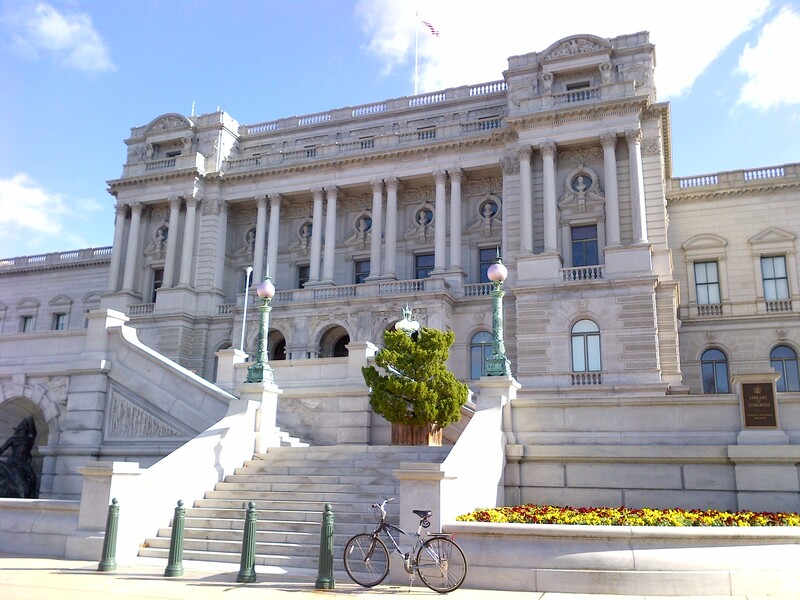 The Madison building also houses the Law Library of Congress and the United States Copyright Office. 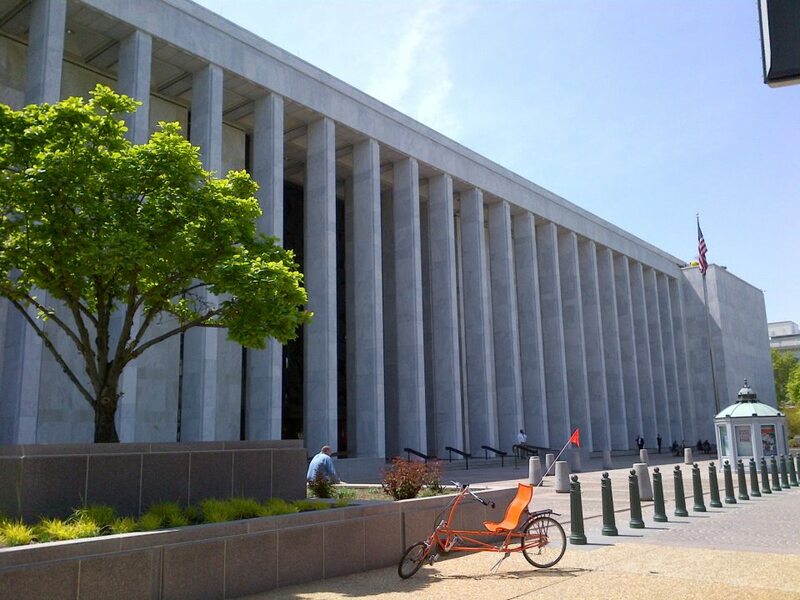 The Madison building is the third largest public building in the D.C. metropolitan area, behind the Pentagon and the building that houses my office. The John Adams Building (see photo below, second row, right) is located between Independence Avenue and East Capitol Street on 2nd Street in Southeast D.C. (MAP), the block adjacent to the Jefferson Building. The building was originally built simply as an annex to the Jefferson Building. It opened its doors to the public on January 3, 1939. The Adams Building contains 180 miles of shelving (compared to 104 miles in the Jefferson Building) and can hold ten million volumes. There are 12 tiers of stacks, extending from the cellar to the fourth floor. Each tier provides about 13 acres of shelf space. The Library’s primary mission is researching inquiries made by members of Congress through the Congressional Research Service. Although it is open to the public, only Library employees, Members of Congress, Supreme Court justices and other high-ranking government officials may check out books. When riding around the Capitol Hill neighborhood east of the U.S. Capitol Building, you can find some of D.C.’s most famous (or notorious) alleys. 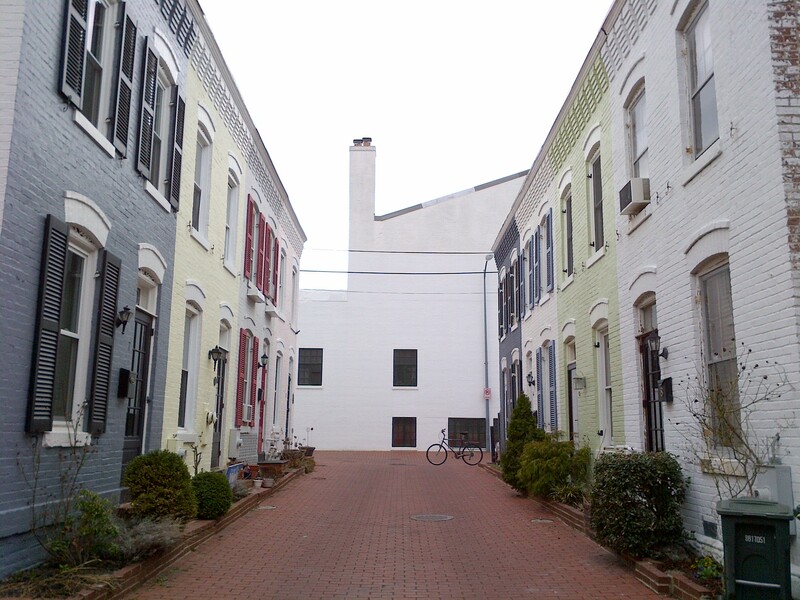 Alleys were built into Pierre L’Enfant’s original design plan for the Capitol city as a way to provide tradesmen with backdoor access to substantial homes and mansions. The alleys at that time also frequently contained stables and carriage houses. Later, after the end of the Civil War, the population of D.C. increased considerably as both soldiers and freed slaves flocked to the city. 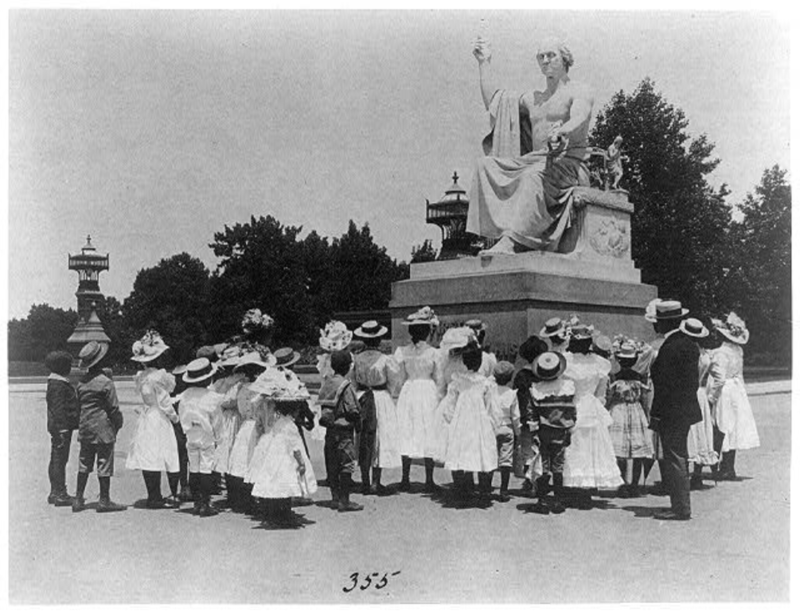 Within a decade after the War, the population of D.C. grew from 60,000 to over 110,000. During this time, many alleys became festering slums where freed slaves and others squatted and worked under substandard conditions. For generations, these D.C. alley dwellers lived off the grid and behind the scenes. This led Congress to pass the Alley Dwelling Elimination Act of 1934. Subsequently, many of the enclaves of converted stables and alley homes were demolished. Only a few pockets of these homes survived, but many of the remaining ones have now been gentrified and turned into smart mews homes for the affluent. 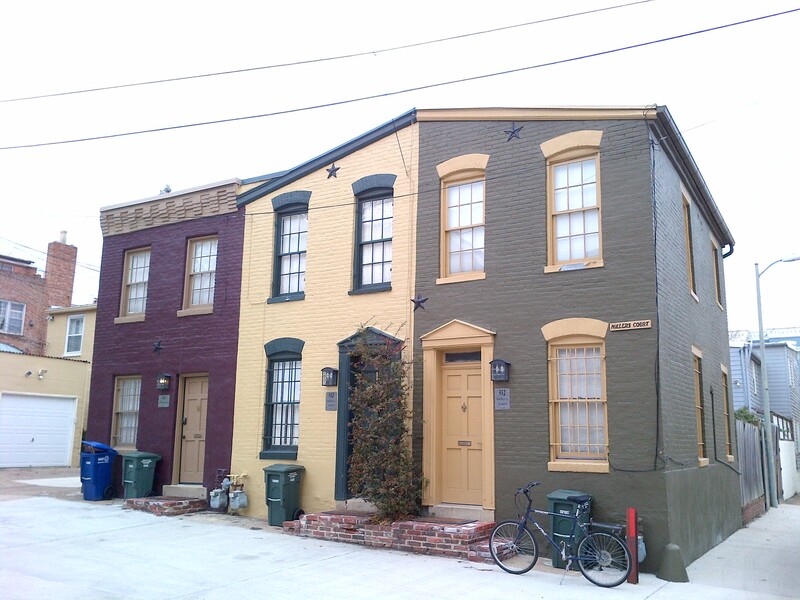 These homes are not located on any street, and can only be reached through an alley. One of the best examples is what is now known as “Library Court,” which can be found by entering the alley across from the Capitol Hill Presbyterian Church at 201 Independence Avenue in Southeast D.C. (MAP). Another example on Capitol Hill is Rumsey Court (below, left), reachable by an alley in the 100 block of C Street (MAP) in southeast D.C. A third alley enclave on Capitol Hill is known as Miller’s Court (below, right), and is located in the alley across from the Frederick Douglass house at 320 A Street in northeast D.C. (MAP), just behind the Library of Congress’ Adams Building. 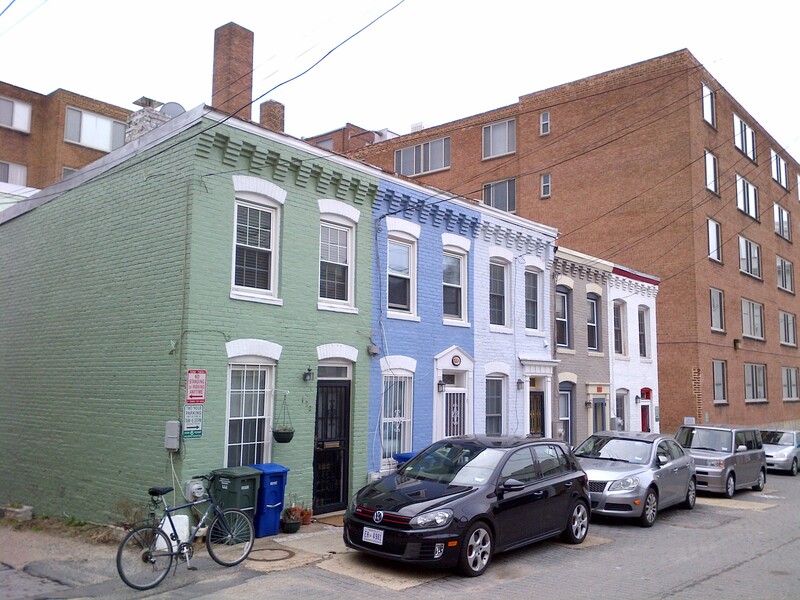 There are a few other groupings of mews houses in D.C., but the number is extremely limited. For those that do exist, given the fact that they are located within the center of a city block and only accessible through alleys, it was only recently that these communities started to be listed on any public maps. And getting there using a GPS can be almost impossible. But they remain very popular and sought after, usually selling within the first few days when one comes up for sale. The Gettysburg Address is a speech that was given by President Abraham Lincoln, and one of the best-known speeches in American history. It was delivered by President Lincoln in 1863, at the dedication ceremony of the Soldiers’ National Cemetery in Gettysburg, Pennsylvania; just four and a half months after the Union armies defeated those of the Confederacy at the Battle of Gettysburg. On the 150th anniversary of the speech, a rare copy of The Gettysburg Address, which is written in the former President’s own handwriting and is thought to have been with him when he delivered the famous civil war speech, was on display in The Library of Congress (MAP). So that’s where I went on one of my bike rides. President Lincoln’s speech, which he made four months after the bloody Civil War battle at Gettysburg that left tens of thousands of men wounded, dead or missing, is considered a seminal moment in the history of the United States. However, it was not immediately recognized as a towering literary achievement. And President Lincoln was not even the keynote speaker at that day’s ceremony. 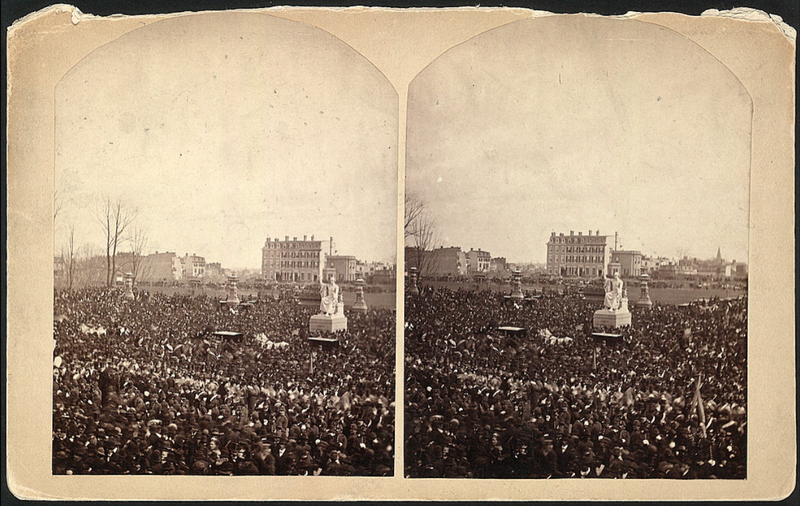 The dignitary who spoke before Lincoln, Edward Everett, delivered what was scheduled as the main speech of the day. The former Massachusetts governor and onetime Secretary of State was the best-known orator of the time, and took two hours navigating through his 13,607-word speech. President Lincoln’s speech, a mere 271 words if you go by the version that’s attributed to Lincoln, took just over two minutes. The speech was well-received by the public attending the event. They clapped politely, a few cheered. But not everyone at the time agreed. The Chicago Times called it “silly, dishwatery utterances.” Journalist Gabor Boritt, who was present, said of other journalists that “they could not find much good to say about it.” Lincoln himself said, “It is a flat failure, and the people are disappointed.” However, on the day following the ceremony, Everett wrote to Lincoln, and said, “I wish that I could flatter myself that I had come as near to the central idea of the occasion in two hours as you did in two minutes.” History would eventually side with Everett’s opinion. There are five known manuscripts of President Lincoln’s now-famous speech, and the most widely quoted one is the oldest. The earliest versions were given to his two secretaries, John George Nicholay and John Hay. Three were written after the address was delivered, and then donated to charities. 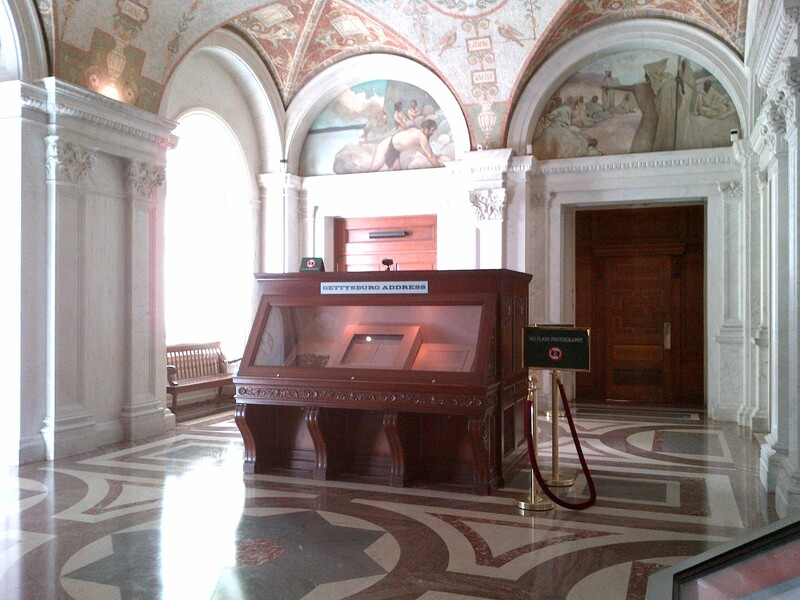 The Library of Congress owns both the Nicholay and Hay copies. The five copies of the speech contain differences in text and emphasis. Noticeably, the Nicolay version does not contain the phrase “under God”, which was later added to other copies Lincoln made of the speech – and appeared in contemporaneous newspaper reports. 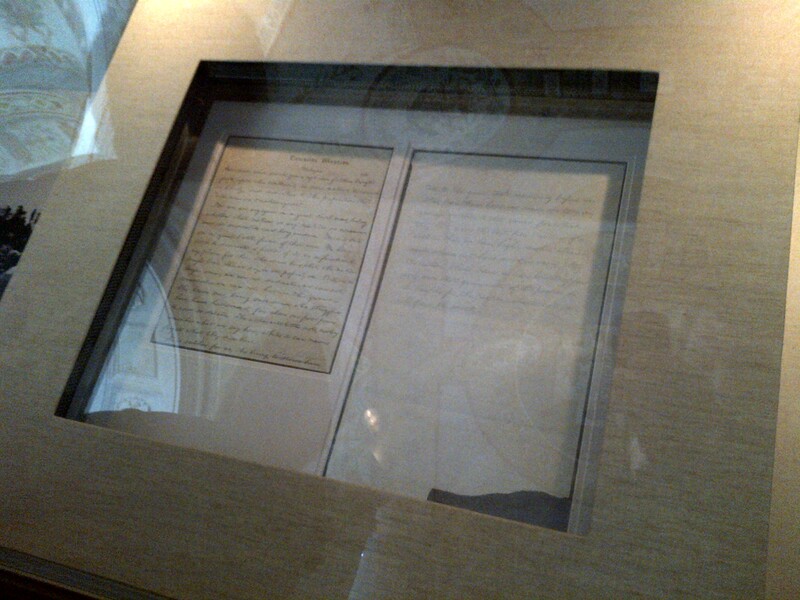 The one I was fortunate enough to see at the Library of Congress is the Nicolay version, which is also referred to as the “first draft” because some historians contend that it was the copy that Lincoln read out at Gettysburg. Interestingly, although one of the world’s best-remembered speeches, it includes the line, “The world will little note, nor long remember what we say here.” So in the end, at least that portion of the famous speech was yet another example of a statement by a President that turned out to be wrong.